Anyone remember these or know what they were called? From the mid 90’s. Found this guy in my parents basement along with some other cars I had as a youth. I remember buying this at a local Caldors (RIP). Anyone still looking for the Forza set? Also found a Beatles set at my local TRU. Besides commuting nearly everyday on the DRZ I have also managed to squeeze in a few fun rides in the past couple of weeks. Spent my Labor Day Sunday morning taking the winding route up Bear Mountain to Seven Lakes Drive. Tons and tons of bikes in the area with similar intent. Some great views as always, especially when the road passes immediately next to the water. Found the whole set after a fresh shipment to my local k-mart. Vdubyajohn - if you are looking for these head to Yorktown. Another weekend, another mix of on and off road riding. The bike is a blast in the curves, is capable on the dirt trails, and just a riot to ring out. Erryday is Error car day! Hmm...didn’t buy it, but I always do find these interesting. Real or fake, I’m not sure, but that’s a mighty big flaw. 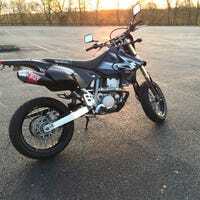 Ahhhh....Supermoto! Now I can travel off the pavement on to the otherwise unavailable paths and trails that I see around my area. First up... an abandoned motel/homeless shelter. This one is a bit of a cheat, close to the main road, and it didn’t take much effort to get to, but I’m counting it. Some local adventures (on road) after about one month of ownership. Need sliders before going off-road, plus my rear tire is nearly shot. I’m not carrying anything with me when I ride, so these iPhone pics will have to tell the tale.